1) It checks a click for compliance with some of the rules. If yes, then it sends it to the corresponding rule. Read more about the rules in this article. 2) If there are no such rules, it sends a click to one of the paths based on the proportions of the traffic distribution among them. 3) It defines the lander on which to send traffic within the selected path, or sends it directly to the offer (based on settings). You can send your traffic strictly to a certain path and lander. In order to do it, add to the Campaign URL the options &to_path = N, where N - number of path where you want to send traffic (the number in the path name, e.g. Path 3). If you need to send traffic to a particular lander within the path, then add an additional parameter &to_lander = M, where M – the number of the lander within the path. If you don't need to calculate LP CTR on traffic flow, then add parameter &exit=1 to Campaign URL. For example, you use backfix-scripts. For force the cost of a click use parameter &set_bid=N. Often you need to send click to any campaign with zero cost. For example, form any lander to other campaign. 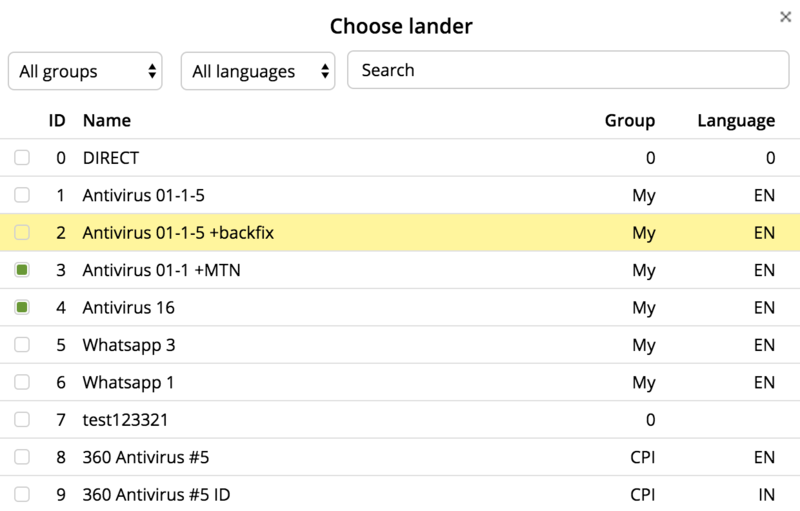 In order to select a lander, click on + Lander. The selection window of the lander will open. Using groups and search, you will quickly find your desired landing page. When you re-open the window, the group will not lost, the next one will be found even faster. Once you click on the desired lander, it will appear within the path. To add another one, click the Add Lander button. 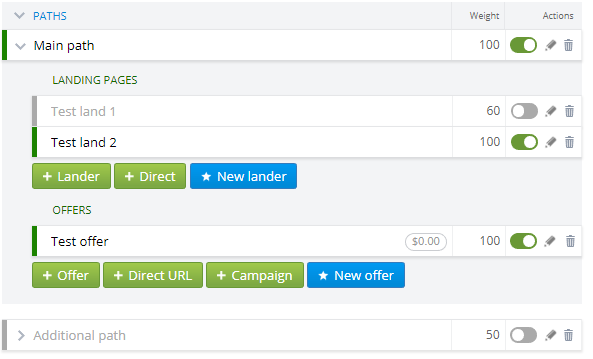 You can also create a new landing page by pressing New Lander. The standard window for lander creation will open. Once saved, it will appear within your path. 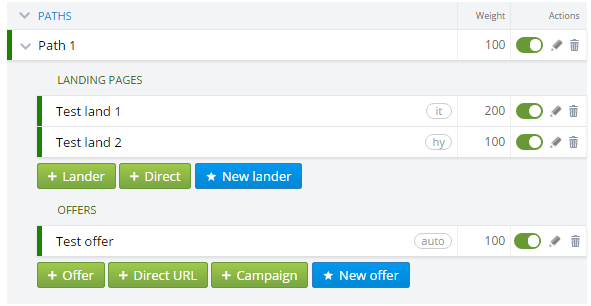 To send directly traffic without the lander, click on Direct button. You can use it within any path or rule, even in conjunction with multiple landing pages. n order to select an offer, press + Offer. As for landers, the selection window of the offer will open. Sometimes you need to send traffic to another campaign in the tracker. 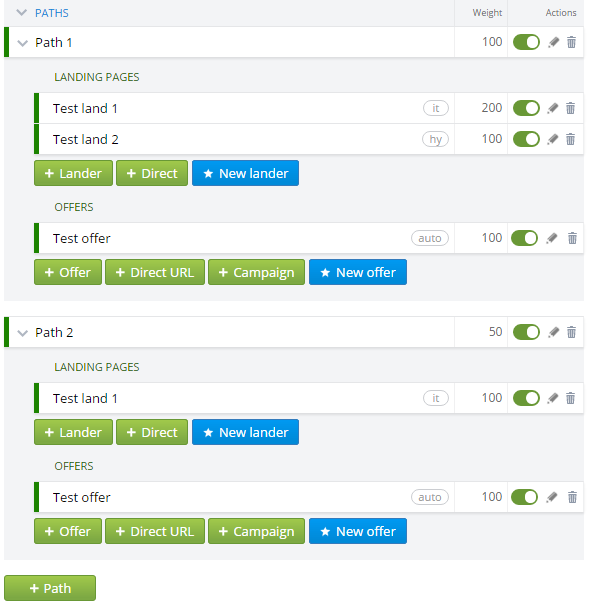 Within the path and rules, you can distribute your traffic to any active campaign of your tracker through the landing page or directly. For doing this, click on + Campaign button. Use the grouping and search to find quickly the desired one in the window of the campaign selection. When redirecting from one campaign to another in the case of similar sources, there is a passing values of all tokens. It’s often necessary to send traffic not to an offer, but to a direct link. To do this, click on + Direct URL button. You can enter the required URL in the appeared field. 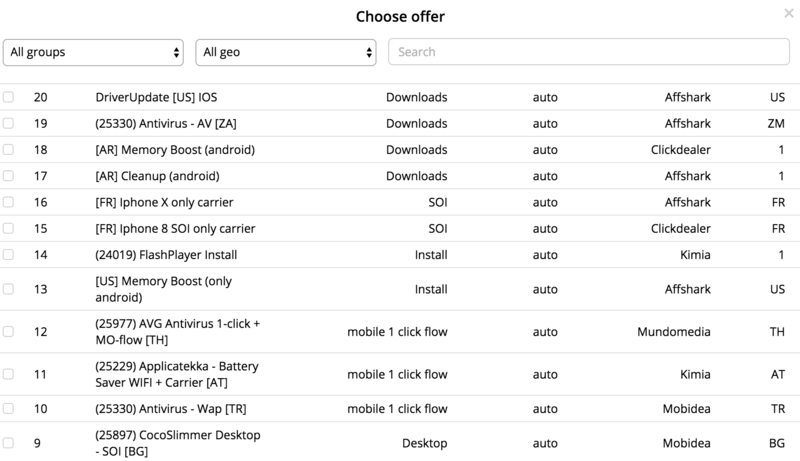 Add multiple landing pages and offers to your path. In this case, traffic will be distributed randomly between landing pages according to the proportion of weights of each one. For example, on the screenshot above, the weight of the first landing page (200) is two times greater than the second (100). This means that it will get twice as much traffic. If percentages are more convenient to you, you can use them. For example, in this case, it’s 66% and 33%. Traffic is distributed between the paths in a similar manner based on their weights. To add the path, just press the + Path button. To stop the lander, offer or path click the icon next to the desired one. To delete click on . To edit click on .